UK based artist David Constantine (aka David A Hughes) is a contemporary abstract/portrait painter hailing from Worcestershire, England. 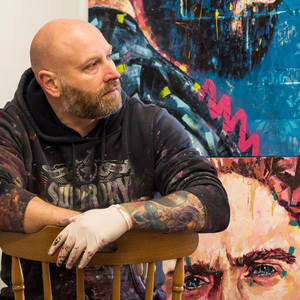 Specializing in what he describes as urban portraiture Constantine’s style was built on the UK streets and later refined at Wolverhampton University and his Black Country studio. His early street work was once found scattered across the UK’s concrete landscape. Currently the one-time Art student and street artist’s time is confined to the studio where urban influences and classical fine art techniques are fused on canvas. Constantine uses a variety of media’s and techniques in canvas production. Focusing primarily on traditional oils and acrylic spray. He produces fine artwork for galleries and commission, on wood, canvas, and print.